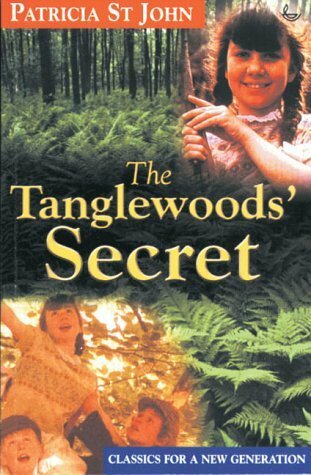 Summary (from Goodreads): Ruth and her beloved brother Philip find solace in the expanse of the Tanglewoods' property. There they escape into bird watching, climbing, and general misadventures with their friend Terry. But life with their Aunt is harsh, and Ruth suffers from an incorrigible temper. Just when she thinks she can't take it anymore, she learns a very special secret about a very special Shepherd. When a dreadful accident hurts one they love, Ruth and Philip learn that the Tanglewoods' Secret isn't meant to be kept a secret. I read this for the Old School Kidlit challenge: a book you loved in childhood. I read this at the age of about six or seven and enjoyed it, but had never revisited it, so I didn't remember much except for a few details. I found that it didn't quite live up on rereading. I think my main problem was that it was just too simplistic. Of course it was written for quite young children, so that isn't necessarily a bad thing, but rereading it now as an adult I just didn't enjoy it as much. Admittedly, the book does make clear that becoming a Christian doesn't make all your troubles and suffering go away, but the issues faced by Ruth and others in the book (including a pretty major tragedy) seem to be got over pretty quickly. I also found myself getting pretty annoyed with Aunt Margaret in the first half of the book; I'm not surprised Ruth keeps being naughty when her aunt is always telling her how bad she is! I also felt that it was unfair that Ruth was often made to help with the housework whilst her older brother was allowed to go out and play, but I suppose that is a sign of when the book was written. The sections I found most interesting were the parts about Ruth and Philip's lives, such as their interest in bird-watching, the games they play together and their schemes for making money so that they can save up to buy a camera, and I wish that there had been more of these in the book. I also liked their relationship - they have a strong friendship as well as being siblings which always good to read about. I think the messages in the book were mostly good and I liked that it was pointed out that adults (such as Aunt Margaret) also need Jesus and don't necessarily always have it all figured out or do the right thing. I just found the whole story a bit simplistic and the Christian parts quite heavy-handed. But I still found things to enjoy about it, and I did enjoy it more as a child (although not as much as some of Patricia St. John's other books). I also found that the childhood favorites I read for the challenge this month didn't really live up to my memories. Thanks for participating!